If Russia is indeed behind the damaging leak of Democratic Party emails on the eve of its national convention, it's not just because President Vladimir Putin likes Republican nominee Donald Trump and his pro-Russian views, former U.S. officials and experts tell NBC News. It's because the former KGB operative hates Trump's Democratic rival, Hillary Clinton, with such a passion that he wants to embarrass her personally and undermine — if not derail — her presidential campaign, they say. For a Russian leader who is considered as vain as he is ruthless, Clinton's criticism long ago crossed over from the political into the personal. He carries a grudge against a woman who has publicly compared him to Hitler and expressed doubts that he has a soul. "In addition to the policy disagreements that they have, I think Putin himself sees some of Clinton's remarks as a personal attack against him and the way he governs his country and how he conducts his foreign policy," said Michael McFaul, the U.S. ambassador to Russia from early 2012 to 2014. Like other former Obama administration Russia policy experts, McFaul said Putin-sponsored hackers were the most likely culprit in the hacking of 20,000 DNC emails that were posted last Friday by WikiLeaks. Cybersecurity experts also say mounting evidence all points in one direction. Several former Obama administration officials said that when Clinton was secretary of state, she was by far the most aggressive and outspoken U.S. official when it came to countering Putin's efforts to consolidate his power domestically, and to expand his sphere of influence in the region and beyond. And when she left government, they say, Clinton became even more combative, going so far as to liken Putin to Hitler in 2014 for his annexation of part of Ukraine. The remark offended not just Putin but the Russian public. 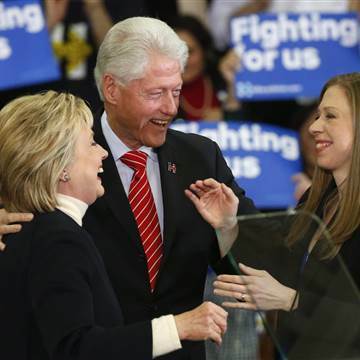 Hillary Clinton with her daughter Chelsea Clinton (R) and her husband, Bill. 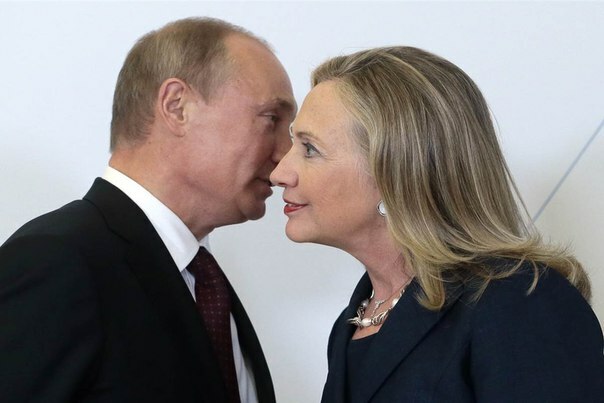 ADREES LATIF / Reuters Clinton was already a critic of Putin during her seven years in the Senate, where she was a member of the Armed Services Committee. In 2008, she made headlines for publicly doubting that then-President George W. Bush had gotten a sense of Putin's soul because as a former KGB agent he probably didn't have one. By the time she became Secretary of State in 2009, U.S-Russia relations were especially tense, given Putin's invasion of the neighboring Republic of Georgia. The new administration launched a "reset" aimed at improving the bilateral relationship with Clinton as one of its leaders. But from the start she was especially suspicious of Putin, and vocal about it. "She was always the tougher voice within our administration on Russia. "Even my colleagues at the White House would agree with that," said McFaul, the top National Security Council official on Russia from 2009 until he left for Moscow as ambassador. He described numerous occasions where top Russian officials, and a "pissed off" Putin himself, would rail against Clinton both publicly and privately. As secretary of state, Clinton's adversarial stance was evident on a wide range of issues, including Russia's support of Iran and Syria, its opposition to NATO as a hedge against Russian expansion and its record on free speech and human rights issues. On one occasion when Clinton suggested a power-hungry Putin was trying to recreate the Soviet Union, "they lit up over that," McFaul recalls, citing meetings with high-level Russian officials. "I was ambassador at the time, and they were livid with her." Clinton was especially critical of Putin's role in Russia's parliamentary elections in 2011, suggesting they were rigged to favor his political party and Putin's own effort to consolidate power. At a gathering of the 56-nation Organization for Security and Cooperation in Europe in Lithuania that December, Clinton called for an investigation into election "fraud" and criticized what she said were growing restrictions on democracy and human rights. "The Russian people, like people everywhere, deserve the right to have their voices heard and their votes counted" Clinton said. "And that means they deserve fair, free, transparent elections and leaders who are accountable to them." Later, Putin publicly fumed that Clinton personally spearheaded an Obama administration effort to undermine the legitimacy of the 2011 election and to empower a fast-growing opposition movement. He even accused her of giving protesters a hidden signal to protesters massing in Moscow with the support of the U.S. government. "I think he genuinely believes that she was trying to meddle in his election and therefore he thinks he can do what he is doing now," if Russia is conclusively tied to the DNC hack, said Evelyn Farkas, who was the Pentagon's top official overseeing military relations with Russia until last September. "It's another example of Russia saying they don't have to abide by the rules, and that they can directly influence elections" in the United States. Farkas, now a nonresident senior fellow at the Atlantic Council's Future Europe Initiative, said Putin has engaged in similar tactics to influence elections in other countries. "This is typical for Russia, using data gathering and then releasing information" to help political allies and undermine opponents. Hillary Clinton with her daughter Chelsea Clinton (R) and her husband, Bill. Clinton was already a critic of Putin during her seven years in the Senate, where she was a member of the Armed Services Committee. In 2008, she made headlines for publicly doubting that then-President George W. Bush had gotten a sense of Putin's soul because as a former KGB agent he probably didn't have one. By the time she became Secretary of State in 2009, U.S-Russia relations were especially tense, given Putin's invasion of the neighboring Republic of Georgia. The new administration launched a "reset" aimed at improving the bilateral relationship with Clinton as one of its leaders. But from the start she was especially suspicious of Putin, and vocal about it. "She was always the tougher voice within our administration on Russia. "Even my colleagues at the White House would agree with that," said McFaul, the top National Security Council official on Russia from 2009 until he left for Moscow as ambassador. He described numerous occasions where top Russian officials, and a "pissed off" Putin himself, would rail against Clinton both publicly and privately. As secretary of state, Clinton's adversarial stance was evident on a wide range of issues, including Russia's support of Iran and Syria, its opposition to NATO as a hedge against Russian expansion and its record on free speech and human rights issues. On one occasion when Clinton suggested a power-hungry Putin was trying to recreate the Soviet Union, "they lit up over that," McFaul recalls, citing meetings with high-level Russian officials. "I was ambassador at the time, and they were livid with her." Clinton was especially critical of Putin's role in Russia's parliamentary elections in 2011, suggesting they were rigged to favor his political party and Putin's own effort to consolidate power. At a gathering of the 56-nation Organization for Security and Cooperation in Europe in Lithuania that December, Clinton called for an investigation into election "fraud" and criticized what she said were growing restrictions on democracy and human rights. "The Russian people, like people everywhere, deserve the right to have their voices heard and their votes counted" Clinton said. "And that means they deserve fair, free, transparent elections and leaders who are accountable to them." Later, Putin publicly fumed that Clinton personally spearheaded an Obama administration effort to undermine the legitimacy of the 2011 election and to empower a fast-growing opposition movement. He even accused her of giving protesters a hidden signal to protesters massing in Moscow with the support of the U.S. government. "I think he genuinely believes that she was trying to meddle in his election and therefore he thinks he can do what he is doing now," if Russia is conclusively tied to the DNC hack, said Evelyn Farkas, who was the Pentagon's top official overseeing military relations with Russia until last September. "It's another example of Russia saying they don't have to abide by the rules, and that they can directly influence elections" in the United States. Farkas, now a nonresident senior fellow at the Atlantic Council's Future Europe Initiative, said Putin has engaged in similar tactics to influence elections in other countries. "This is typical for Russia, using data gathering and then releasing information" to help political allies and undermine opponents.